Paul Ryan speaks in front of the Dallas County Courthouse. Republican vice presidential nominee Paul Ryan spoke in front of the flag-draped Dallas County Courthouse in Adel this morning. Ryan talked about the Democratic national convention. “There’s a little thing going on over in Charlotte, North Carolina this week. You’re gonna hear a lot of talk, but you’re probably not going to hear this quote that President Obama made four years ago. ‘If you don’t have a record to run on then you paint your opponent as someone people should run from,'” Ryan said. Ryan, a Wisconsin congressman who chairs the Budget Committee in the U-S House says, the Democrats are doing everything they can to avoid talking about Obama’s economic record. “We are going to hear from President Clinton tonight in Charlotte. My guess is we’ll get a great rendition about how good things were in the 1990s, but we’re not going to hear much about how things have been in the last four years,” Ryan says. Paul Ryan makes a point during his speech. 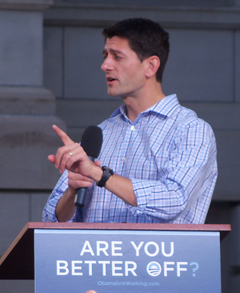 Ryan stood in front of a large sign that said “Are you better off now?”. That’s the question Ronald Reagen famously asked in the 1980 presidential campaign. Ryan says Reagen replaced an ineffective Jimmy Carty and it’s time for Mitt Romney to replace an ineffective Obama. “The president did inherit a tough situation when he came into office. Any fair measurement of his record, you have to acknowledge that,” according to Ryan. He says Obama’s took the wrong step by pushing through the stimulus package. “They promised that if we borrow all this money and spent it through all these government agencies, unemployment would never get about eight percent. It hasn’t been below eight percent since then,” Ryan says. “And then he quickly turned to a partisan government takeover of our health care system Medicare is being threatened by Obamacare.” Ryan also recalled “Joe the Plumber” from the last campaign and said it showed President Obama’s philosophy of redistributing wealth. Ryan told a crowd of over 700 that Mitt Romney is the person the country needs to turn around the economy. 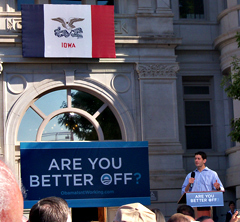 The event wrapped up a two-day campaign stop in Iowa for Ryan.